My original plan for today's blog post was going to be a couple extra 'bonus' inspirations, however once I picked up the book, I was completely and utterly sucked in. It's fabulous! I'm not sure exactly why it has sat on my bookshelf unread for so long. I've been told over, and over again how fascinating the book is. For some reason, I thought it was going to be more of a text book type book. Interesting, but not exactly a fascinating read. I was of course very, very wrong. If you haven't yet read it, try to get yourself a copy! Just Up on the site...Beau Anderson's Freedom Through Flamework!! Just up on the site is an exciting new class. Beau Anderson will be coming to Beadfx this spring. Beau Anderson, born in Bellingham, WA was introduced to the torch by his mother SAGE at the young age of seven. 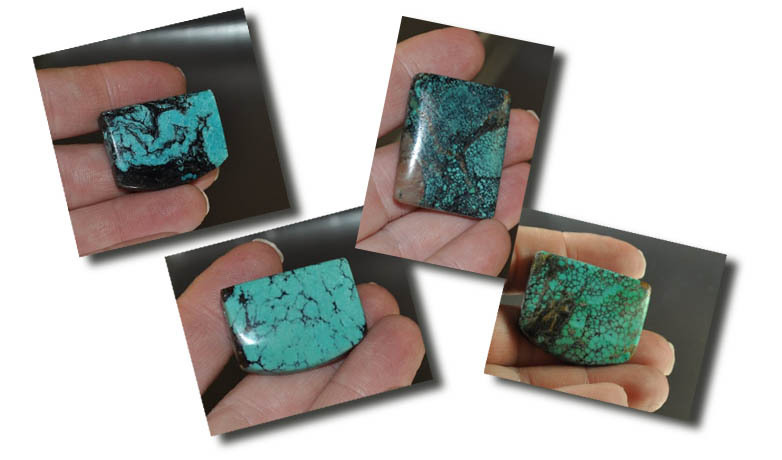 Although he has diverse interests, Beau's focus within glass art has explored beadmaking and its history, as well as, integrative multi-media projects. He has demonstrated and instructed the art of glass beadmaking throughout the Americas, both at a grassroots level and at such prestigious institutions as Corning Museum of Glass, Pittsburgh Glass Center, Pilchuck Glass School, Red Dear Colage and FDV Barcaloa. Beau will be offering two classes with us this May. Freedom Through Flamework--Part 1, May 27th to 28th. In this two day intensive class students will learn to combine intricate detailed designs with unique sculptural forms. Learn a list of techniques spaning from the ancient to the newley discovered. This class is aimed at the advanced beginner to intermediate level student. These students should have taken an introduction to Lampworking course. 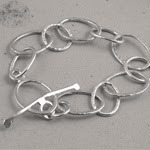 May 29th to May 31st is Freedom Through Flameworking--Part 2. In this three day class students will learn to combine intricate detailed designs with unique sculptural forms. Learn a list of techniques spaning from the ancient to the newley discovered. This class can be taken on its own or as a continuation of the Freedom Through Flamework--Part 1. This class is geared towards the intermediate to more advanced student. These students would have taken at least an introduction to Lampworking course and have additional torch time. This class be taken as a continuation of Part 1 or on its own. Registration is available for these classes only until Friday May 7th. If students register for both Freedom Through Flamework--Part 1 and Freedom Through Flamework--Part 2 they received the discounted rate of $1000.00 +GST. As hinted at last week - something really new from Swarovski Crystallized Elements. Not Crystal, not Pearls, new Ceramic Beads. This is a first for Swarovski, and they have been working on the technical challenge of using this new material. The end result is a stone look that is intriquing, but still smooth and sophisticated. This, THIS - is why Art Patronage is important. This would never have been done without a sponsor. Explore the Sistine Chapel, without the crowds. Fly around the room, zoom up to the ceiling or crawl on the floor. This is wonderful. Give it a chance to load. With Marg recently back from Tucson, we have a number of One-of-a-Kind stone focal beads that we just can't offer online - as each one is unique. But, I can show you some photos and you can decide to drop into the store. Store hours and a map are here. These are actually beads - they mostly have a hole from side to side, near the top. 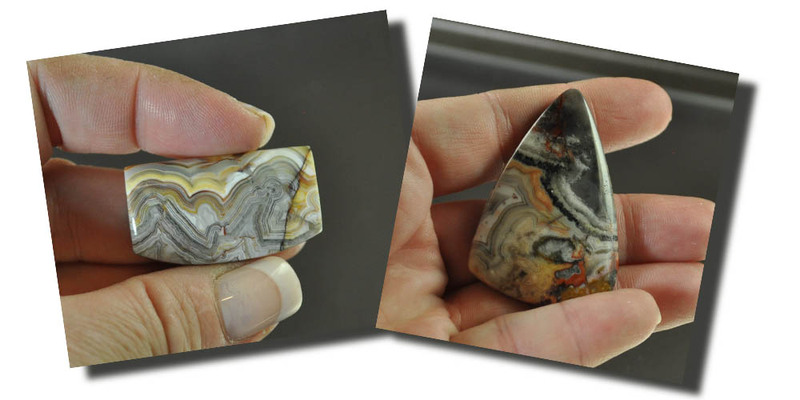 For instance - this is Owyhee Laguna Lace Agate - the prices range from $24 to $38. 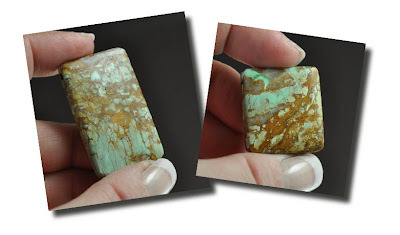 This is Australian Variscite - from $30 to $65. 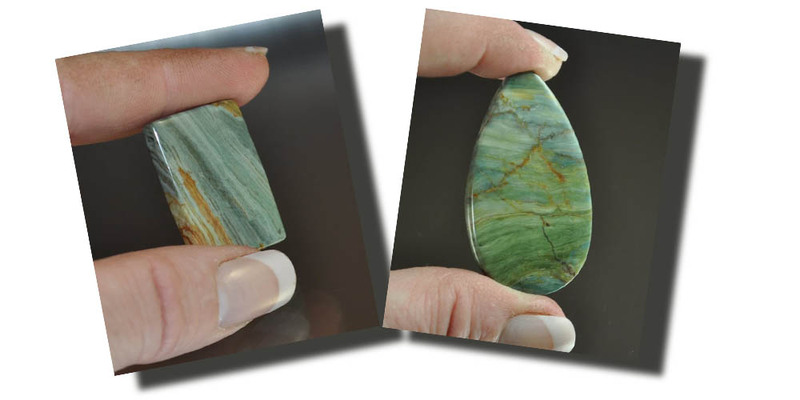 This is a lovely jasper - very silky colours - prices range from $10 to $25 each. This is a Crazy Lace Agate - they are $12 each. These are Fossil Coral - These are actually cabochons, not beads. They range from $8 - $12, depending on the size. I like the dark one - I think he looks like an owl! 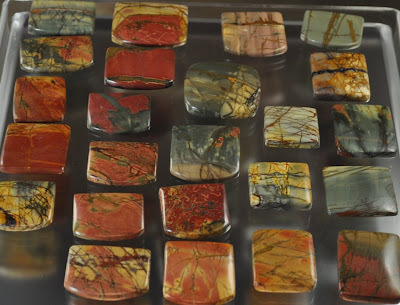 Some wonderful Red Creek Jasper. Look at all that variety! $7.50 each! And there's more besides. So - just another reason to come in person! Come and get lost in the beads! Normally, when something doesn't work as planned - I would hide it away so that no one could see. However, I'm all for showing the good, the bad, and the ugly ;-) It's how we learn afterall, and if you can learn from my mistakes, rather than making your own costly ones - all the better. Before I show you the picture, I want to make a couple notes. 2) Somehow I failed kindergarden in the using scissors department. Next time I won't reduce the hearts so much, and be more careful to make sure the cutouts are exact. Not entirely sure what I was thinking. That resin was magic, and would make it look awesome anyway? 3) I have not yet cleaned up the silver, they still need a bit of filing, polishing, and buffing work. 4) Out of 9 pendants - I have 2 to 4 which I think will be salvageable once I've cleaned them up a bit. We'll see. 5) Does anyone know how to remove cured resin? Have a great weekend all! Tonight was supposed to be movie night with the kidlets, but after my daughter destroyed another batch of my makeup last night. I'm pulling out my mica supplies and letting them make their own play makeup. If you can't beat them join them. And no, I can't hide it any higher than I've hidden it already. The makeup which they still managed to get was on the highest shelf in my laundry room (which I can't even reach). My girls are quite ingenious though. If you place a step stool on top of the washing machine - it's quite reachable by 4 and 6 year olds....sigh. Every year or so, I become completely disgusted with my work space. It's unorganized, messy, and I can't find anything. On the other hand, I like to have everything out where I can see it. If I can't see it, it doesn't end up in any of my designs. Now that I don't actually own a bead store anymore, I have more time to make create...funny how that happens... :-). I have more time to create, more of a need to create (I need to make a living somehow) ;-), and the more of a mess I'm making in my "ahem" studio, also affectionately known as the dungeon. 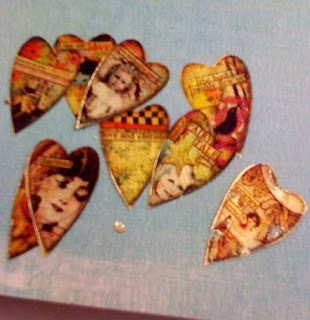 While taking a wee break, I had a look through Sherri Haab's mixed media book - I would link to it, but we seem to be out at the moment. In any case, the book features a ton of projects combining metal clay with resin, concrete, enamel, among others. I came across one project that used a digital collage, but instead of printing on regular paper, you print in reverse (assuming there's text) on transparency film, and then back it in gold leaf. I happened to have a pack of transparency film, I just needed to get the cheap gold foil. I do have a book of real gold leaf for lampworking, but I wasn't about to use that for this project. I've got the pendants now fired, and tumbled. The transparencies have been printed and glued in. I'm now just waiting for them to dry, and then I'll pour the resin. I think these are going to turn out fabulously. Here are some preliminary pics. I'll post some better pics once I have the resin poured. These are the foiled hearts. I like how the foil breaks a wee bit. Hopefully, it'll give it a bit of a mixed metal look with the silver peeking through. We'll see how that works out. The pics of the metal clay hearts didn't quite work out. I'll try again later today. Next time I make these, I'll make the images much smaller. 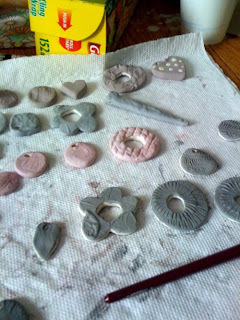 The hearts are quite large, but I still managed to make 3 pendants with one pack of clay, and a syringe. Ok, so March Break is over and March Madness is over so now we are ready for Spring!!! With spring comes great classes so clear up some room in your schedule because you will not want to miss what's coming up. This week we have the Oh! Ogalala Bracelet with Cindy Vroom. This bracelet is gorgeous and the class is open to all levels! Class runs from 6 to 9pm. This weekend is packed. Saturday and Sunday Amy Waldman-Smith is offering her Learn to Make Glass Beads weekend. This is an introductory lampworking class and is a great way to get started. Nadine Foskin is here with her Dangle Drop Earrings from 10:30 to 12pm. This class will teach you to make wrapped loops and simple loops as well as earrings. It is a great opportunity to learn this skill. 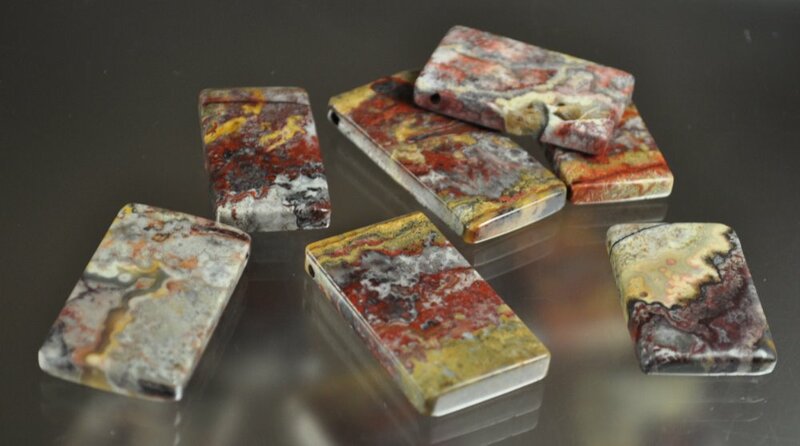 Jennifer Tough's Introduction to Fusing class from 1:30 to 5:30pm has one space left! Register soon to avoid disappointment. Sunday March 28th is Charmed I'm Sure with Heather Bell-Denison from 10 to 5pm. 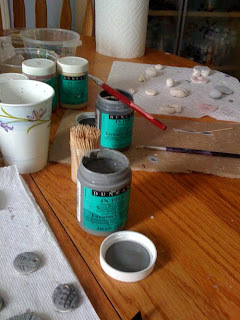 This is an introductory level Art Clay Silver class. That brings us to April and what a month! We will be closed on Good Friday, April 2nd and also on Easter Sunday April 4th. But, after that we are jam packed with classes. Thursday April 8th is the beautiful Dancing Dahlia Brooch with Nadine Foskin from 6 to 8pm. This is open to all levels. Friday April 9th is Charmed I'm Sure with Heather Bell-Denison from 10:30 to 5:30pm. Saturday April 10th is Basic Bead Stringing with Nadine Foskin from 10 to 12:30pm. This class filled up with a wait list last time so early registration is highly recommended. Stephanie Dixon is here on April 10th as well from 2 to 5pm with the Wire Lace Multistrand Crocheted Necklace. This is a great way to learn to crochet with beads and to start using the wire lace! Sunday April 11th Stephanie is back with the Wire Crochet Cuff Bracelet from 1 to 4pm. This is just one weeks worth of classes. Check out the site for more information on April. Don't forget we have Happy Hour Torching this Thursday from 5 to 9pm. Buy one hour get one free! Hey ho - off again. But this trip is a working trip. Of the best kind. Beads. Crystals. We're off to a Swarovski conference. Are you jealous yet! BTW - the Swarovski Crystallized site has a survey and you could win a bracelet - if you want to go visit and answer a few questions. I mentioned last week that there was a new colour of Pearl - but there is also a new shape! The new shape is 5840 Baroque Pearl. This is a new addition to the "Floral" series of shapes - this is 6902 Zinnia Pendant. This joins the Orchid and Lily Pendants. The Cosmic Ring expands and goes square - well - squarish. I like this irregular shape better, I think. This is Cosmic Square Ring Fancy Stone 4437. And speaking of square - this is new - the double drilled Square Bead 5180. 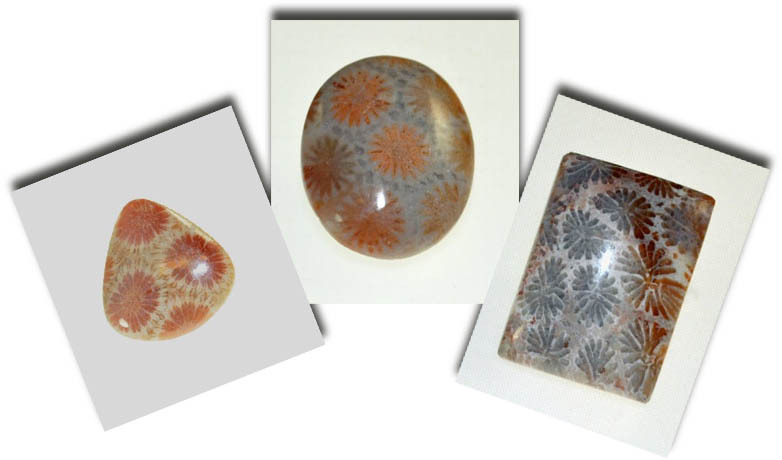 The most exciting new shape, however, is the Artemis Bead, 5540. This is a Cone shape, with a pronounced dimple in the large end. I'm looking forward to playing with these! And, we round up with the Wing Bead 5590. SteamPunk - is a visual esthetic born of a science fiction blend of Victorian science and sensibility with advanced technology. Think steam-driven robots, zeppelins plying the skies, coal-fired computers, clockwork anything, and everything adorned with brass and gears and lovingly hand-made. Got it? Good - check out Daniel Proulx's awesome Steam Punk inspired jewelry. 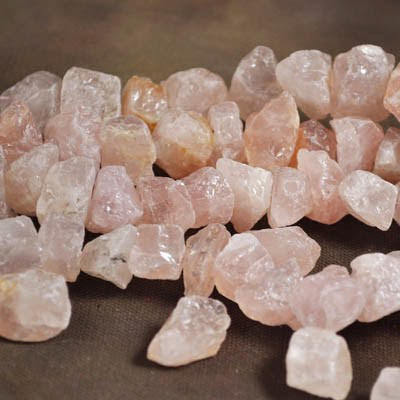 Rose Quartz Rough Chunks - technically not new, but we haven't had this in long time. Love the contrast of the soft pink and the rough texture. 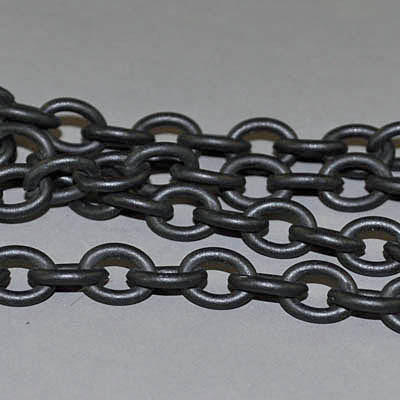 Black Enamelled Chain. How awesome is this? Matte Black Chain! oooooooh! Aaaaaaah! It's been an interesting week for me. I'm still not feeling great, and my sleep schedule is completely out of whack. I woke up around midnight last night after sleeping a good 16 hours - yeesh. I put on the coffee, and headed down into the studio. 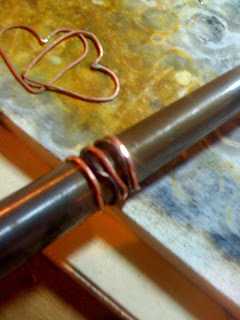 I started out by making more blossom rings, and then ran off on a new tangent with copper wire. With the Ice Resin coming in fairly soon, I'm planning on lots of projects for you - some as classes, and other free ones to post here, or in the Inspiration section. 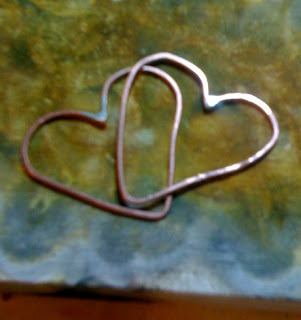 I then got distracted again, and made up a set of copper stacking rings. I also made up a bunch in fine silver, but those are in the tumbler right now. http://barbarabriggsdesigns.wordpress.com/ - fabulous one of a kind jewelry! 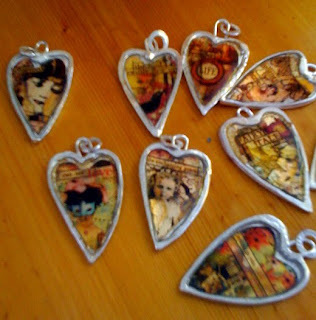 http://lorelei1141.blogspot.com/ - More amazing jewelry! 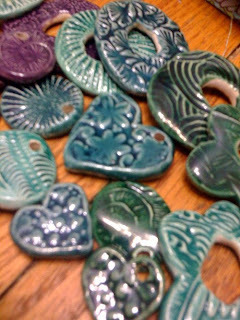 http://www.earthenwoodstudio.com/blog - A ceramic artist who actually knows her stuff - unlike me ;-) Lovely, lovely beads! Here we're into day two - I've now made about a zillion ceramic beads that I'm planning on using to test out various ceramic glazes I've acquired over the years. I will say right now, that I'm no expert in ceramics. In fact, I'm fully willing to admit that I'm one of those highly annoying people you see at craft shows. You know the ones - You've lovingly laid out your booth with all of your gorgeous works of art that have taken years of practice and experience to perfect, and some idiot comes along and says - Huh...I can do that. No, I would never, ever in a million years say it out loud. I have thought it though. And I have actually gone on to try making some of those things. I can say for an absolute fact that things are almost ALWAYS much more complicated, or involved than you think. This applies especially to things that look ridiculously simple at first glance. 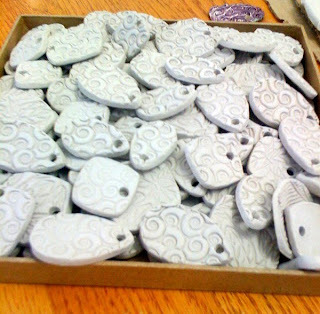 In process - bisque fired beads getting a coat of glaze. That grey jar is actually a pretty colour called blue mist. I've also been working on a new large batch of those glass pendants for the store. These are a bit weird for me. They're one of those simple little things to make, that don't quite fit in with all of the other things I do. That said, I enjoy the process. These actually take about about a week to make from start to finish. 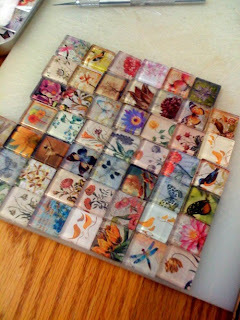 Step 3) Apply a few drops of diamond glaze to the paper, and then firmly press down a tile on top. Wipe off all of the excess glaze, and let dry for a few hours or overnight. Step 5) Sand down the sides of the bazillion little squares, and scrape off any excess glue, and glaze you might have missed off the glass. This step usually involves stabbing myself repeatedly with the exacto knife. This part can be done in front of the telly, which makes it far less tedious than it sounds. However - see step 6, do it in front of the TV at your own risk. Step 8, Let dry for a at least a day, then use e6000 to apply the bails. I've tried just inserting the bails directly into the ice resin, and yes, that does work. However, they tend to slide around a lot, and I just don't have the patience for that. Glue it is! 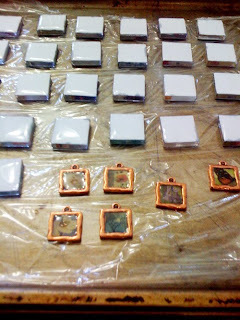 Step 9 - Dry for 2 more days to let the resin cure, and voila - new pendants. Tiles that still need to be sanded down. Lampworking 101 Part A --begins tomorrow! It's Beginning to Look Alot Like Springtime!